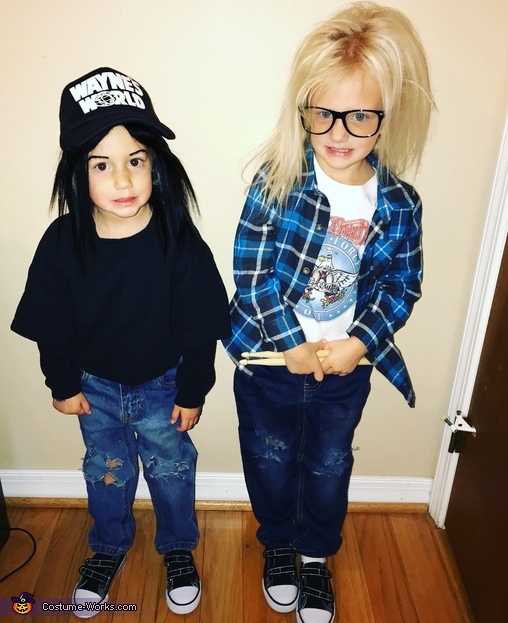 My two daughters Aubrey (Garth) & Jordan (wayne) dresses up as Garth and Wayne from Wayne’s World! Aubrey is 4 and Jordan is 2. Garth’s hair is actually Aubrey’s natural hair with a little hairspray. Jordan has blonde hair so I had to glue black extensions into the Wayne’s World hat, and added black eyebrows. Everyone was obsessed with their costumes and we were stopped numerous times to get their pictures taken.